Something of a local landmark in this quiet rural community, "The Bow" serves as Meeting Point, Restaurant, Post Office, Grocery Store, Video Store, Cafè and fuel station. In Australia's South West, on the corner of South Coast Highway and Valley of the Giants Road, Only a 5 minute drive from The Tree Top Walk, Peaceful Bay on the Southern Ocean and Nornalup on South Coast Hughway. Bow Bridge Roadhouse provides quality food at reasonable prices and has become famous for its homemade hamburgers, in particular the Bow Burger, which is using the top secret Bow Bridge hamburger recipe. 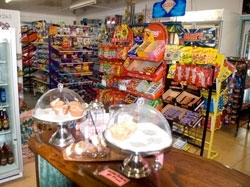 Since its establishment some fifty years ago, The Bow Bridge Roadhouse has become a one-stop-shop, providing everything you might need while exploring the area. Everything from fuel, fishing gear, groceries and beer through to delicious local delicacies including marron, olive oil and wines. Your can try some of our Italian-style coffee and cappuccinos, served with homemade cake or muffins. You wont be disappointed. Bow Bridge Roadhouse is set on the banks of the Bow River. 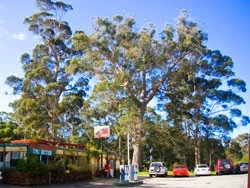 Customers can dine on our renowned food while they take in the glory of the surrounding pristine old growth forest. 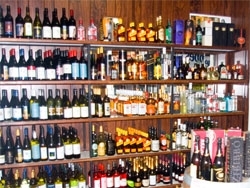 While at Bow Bridge Roadhouse, you can pick a drink from our well stocked fridges, or alcoholic beverages of all shapes and sizes from the onsite liquor store.